Veterans Day (November 11 in honor of Armistice day) is a time for recognizing the sacrifices made by members of our armed services. So this time of year I like to call people’s attention to a little-known North Carolina program that benefited the state's Confederate veterans. About 75 percent of the operations performed by surgeons during the Civil War were amputations. For those who survived amputation and the resulting infections, the pursuit of artificial limbs was natural. Artificial legs, and to a lesser extent, arms, also helped the amputees get back to work in order to support themselves and their families. The United States government assisted Union amputees after the Civil War, but Confederate veterans were considered the responsibilities of the states. North Carolina responded quickly to the needs of her citizens and became the first of the former Confederate states to offer artificial limbs to amputees. The General Assembly passed a Resolution in February 1866 to provide artificial legs to amputees. (Because artificial arms were not considered to be very functional, it was another year before the state offered artificial arms.) The state contracted with Jewett’s Patent Leg Company, and a temporary factory was set up in Raleigh. During the five years that the state operated the artificial limbs program, 1,550 Confederate veterans contacted the state for help. 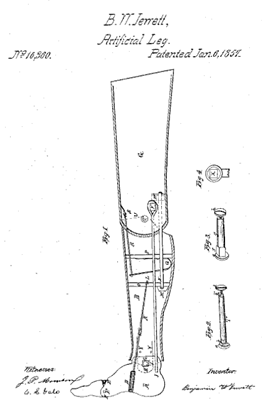 Samuel Clark's 1866 leg. It is currently on display at the North Carolina Museum of History. There are two Jewett legs that are on display in North Carolina. Robert Alexander Hanna’s below-the –knee prosthetic is in the visitor’s center at Bentonville Battlefield in Four Oaks. Hanna's family reported that he made a variety of peg-type legs to use on the farm so that he could save the manufactured one for special occasions. Samuel Clark received an Jewett leg for his above-the-knee amputation. His later pension indicated that he was unable to use the device. Clark's prosthetic leg remained in his family and is now on loan for the new exhibit called North Carolina and the Civil War: The Raging Storm, 1863, which just opened at the North Carolina Museum of History in Raleigh. The records of the Artificial Limbs Department are available for research in the North Carolina State Archives. And an index to all of the records, by the name of the veteran, is published in Phantom Pain, which is on sale on at our Historical Publications office.